A five-part series on the core fundamentals to drawing. 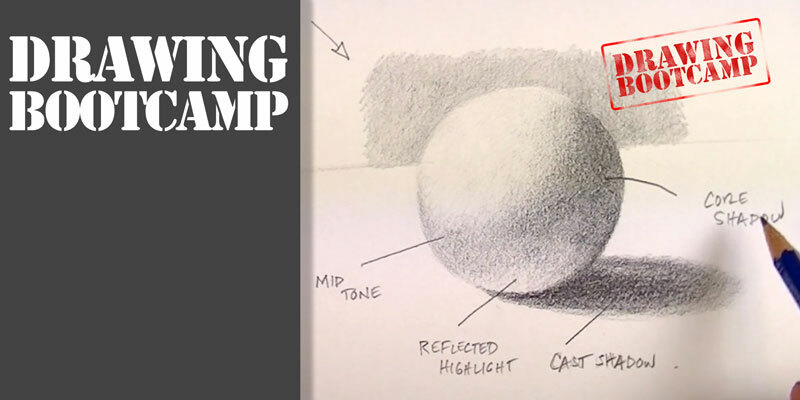 Learn to see as an artist, use line to add depth and form, develop shading and value, and create the illusion of realistic textures in your drawings. Each lesson covers a different concept and method. Over five hours of instruction. This drawing bootcamp is great Matt, I know I’ve mentioned before about my chronic pain conditions to you, well I’ve not been too good recently, my pain level is really bad and to make matters worse I’ve got a virus I can’t seem to shake off. Normally when my pain is bad I can’t sit at my table easel. So I got a couple of sketching boards so I can sit on my sofa where my back rest and heat pad is and draw away, but when I’m not actually feeling too good it’s hard for me to do any drawing. I’m also waiting to go on stronger morphine and it’s taking a while because hospital is behind with letters of instructions for my GP to wean me off pain mess I’m on now to cross over to stronger morphine patches Which I should of started beginning of new year.im pretty strong with my pain levels meaning I can stand quite a lot but I’m really needing that pain relief now. It frustrates me I can’t draw or do my lessons but what I’m getting too ( eventually ha ha ) is that this drawing boot camp is a way for me to just watch and kind of acts as a revision of the elements of art and it’s just bringing it all back to me what I’ve learnt so far on secrets to drawing I’m doing. I will actually do these properly at some point but they are great for me to watch and re- cap back a bit.im wanting to get secrets drawing finished this year but again the start of the year health wise is not great but I will get there I’m sure then I can move onto your portraits course. Plus also wanted to say, I actually enjoy just watching you work and the way you talk and teach is really good, your voice is quite calming I think, which is why i find you easy to understand which is important when you are learning art, some seem to rush over so quickly. I remember my art teacher at school and she didn’t know how fast to skim over stuff which didn’t always go in. You really are a fantastic teacher, I know I keep saying that but you are and we students I’m sure appreciate it, I’m sure I do.your passion for art and of course teaching it shines through always. Hi there. I have recently become a member and am really enjoying the recorded lessons. Currently busy with drawing bootcamp. Unfortunately it seems that lessons 3 – 5 are the same as lesson 2? Click on the tabs on the left to go to the next lesson. Each tab has a different video. Videos 3-5 are different from videos 1-2. When I open this page from my history All I seem to get is video 5 on all the tabs on the left. That may be the problem that Elize had encountered. Is there a place on your site that I can go to study proportionality in drawing? That seems to be my biggest challenge right now. Thank you. You are an excellent teacher. This is a great place for me to start since years ago I pretty much just drew contour drawings with lines, and had only experimented with real value towards the end. I’m so glad after all this time I am getting back into it!! Your art lessons are so much better than the drawing books I took out of the library. Glad to be here. Prerecorded drawing bootcamp lessons won’t open and play. It stopped working a few days ago. I would appreciate any ideas you can give me. Matt. I was able to follow you and did a pretty good job drawing part of the flower. But when I tried on my own I kept losing my place and couldn’t figure out which petal I should draw. Is there a way a beginner like me can not get too confused? Thanks. The Values lesson was very interesting and helpful. I hope that sometime you’ll consider doing a similar one with pen and ink. I’m having a lot of trouble using a full range of values on my cross-hatched portraits, especially. Thanks. Thanks for another great course. I have just finished lesson 3 & I did enjoy the sphere! Learning a lot but also I am gaining that important element of confidence. Awesome! Love the paintbrush; mine looks like one could almost pick it up. You are a fabulous teacher. Now onto another gouache. One year and 7 months later, I wish you two Happy New Years and, again, thanks for being there. Hi Matt. At 70 years old i have wanted to draw and paint for a long time. I am a living example of student B. Drawings I did with a little ‘free expression’ were never received well so eventually Igave up. Now I am trying again armed with your mindset that “Ican draw given the knowledge and the practice”. I will succeed Matt.